Twenty-First Century schools need more than just a face lift. Yes, we need to remodel the "traditional" style classrooms where student desks are aligned in perfect columns and rows directly pointed toward the teacher. Yes, we need to create safe and collaborative spaces that are both conducive to learning and are aesthetically pleasing. But our schools need much more than this. 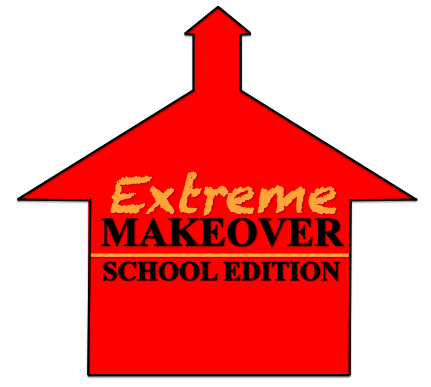 What I'm talking about, is an Extreme Makeover from the ground up! I would like to introduce three initiatives that I think (and are research supported) could substantially transform our schools into institutions that are in the best interest of our students and actually prepare them for their future in this rapidly changing, unpredictable world. This blog post is my attempt to briefly scratch the surface of this challenging (but totally possible) endeavor. “School culture is the set of norms, values, and beliefs, situations and ceremonies, symbols and stories that make up the “persona” of the school.” But cultural change must be achieved--and it must be achieved well--if we are to prepare our current and future generations of students for an ever-changing world that is becoming more demanding each day." Create a vision and mission: Building a shared vision is the ongoing, never-ending, daily challenge confronting all those who hope to transform their schools into learning communities. And until educators can describe the ideal school they are trying to create, it is impossible to develop policies, procedures, or programs that will help make that ideal a reality. Each learning institution should ask itself, "What is it we expect our students to learn, and how will we fulfill our collective responsibility to ensure that this learning takes place for all of our students?” Furthermore, all valued stakeholders should be involved in establishing the vision for their institution, and should be committed to implementing it. Establish a Professional Learning Community: A “professional learning community” is a place where teachers inquire together into how to improve their practice in areas of importance to them, and then implement what they learned to make it happen. This "place" can be in a classroom, in a school building, or somewhere in the midst of our online, social media universe. Regardless of the space, it is imperative that educators create some type of learning community where they can learn, share and grow together, because "all of us, are smarter than any one of us". Maintain support and accountability: Leaders in education must transparently communicate purpose, foster collaboration, build capacity in his or her staff, hold people accountable, and provide support and accountability when needed. This same support and accountability should also be instilled in our students to ensure learning and understanding by all students, at high levels. "People use extrinsic rewards expecting to gain the benefit of increasing another person's motivation and behavior, but in doing so, they often incur the unintentional and hidden cost of undermining that person's intrinsic motivation toward the activity." Student Inquiry: Inquiry-based teaching has been found to have a significant impact on student learning. Students should be engaged in making observations, formulating then asking questions, analyzing evidence, evaluating data, formulating explanations, connecting their explanations with scientific concepts, and communicating the justification for their explanations in all content areas. Consequently, when students engage in these actions, their learning becomes more personalized and meaningful to them, which in turn allows them to gain a deeper level of conceptualization and understanding. Student Autonomy: Students need the opportunity to have voice and choice in their learning by identifying their learner profile. "A student’s learning style, intelligence preference, gender, and culture can influence learning profile." Not only does this strategy increase student engagement, but it also helps individual learners understand modes of learning that work best for them, and to offer those options so that each learner finds a good learning fit in the classroom. This ultimately differentiates and personalizes the learning for each individual student. Meaningful Feedback: Consider non-tangible rewards. "Praise and positive feedback are much less corrosive than cash and trophies." Provide useful information. "The more feedback focuses on specifics ("Great use of color")--and the more the praise is about effort and strategy rather than about achieving a particular outcome--the more effective it can be." "Companies are seeking employees who have academic skills, common sense, and social skills, and if they have to recruit overseas to accomplish this, they are willing to do so. Nations like India and China are providing workers who have the kind of skills that companies want, and they are increasing their recruitment efforts globally in order to fill this need." Creativity, Critical Thinking, Communication, Collaboration: "We are moving from an economy and a society built on the logical, linear, computer-like capabilities of the Information Age to an economy and a society built on the inventive, empathic, big-picture capabilities of what's rising in its place, the Conceptual Age." The arrival of desktop PCs and the automation of business processes, they say, have heightened the value of two categories of human skills. The first is what they call “expert thinking--solving new problems for which there are no routine solutions.” The other is “complex communication--persuading, explaining, and in other ways conveying a particular interpretation of information.” Thus, moving forward in the 21st Century, these particular skills will be more important than ever for our students to master in order to remain competitive in the global economy. Arts Integration: "Ten years of employment data and discovered that the largest gains have been in jobs that require people skills and emotional intelligence, imagination, and creativity." The abilities our students will need--Design, Story, Symphony, Empathy, Play, and Meaning--are fundamentally human attributes, which is why integrating "The Arts" is so important. Visual and performing arts such as music, theater, dance and art help to develop the type skills needed for tomorrow. Most surprisingly, "A master of fine arts, an MFA, is now one of the hottest credentials in a world where even General Motors is in the art business. MFA is the new MBA." Science Technology Engineering and Mathematics (STEM): STEM education has never been as important for U.S. students as it is today. Compared with other students around the world, U.S. students are particularly falling behind in math and science. As a result, fewer students are graduating college with math and science degrees and thus, failing to fill math and science positions in the workforce. Simultaneously, as the U.S. demand for technology increases exponentially, the supply of innovators steadily decreases, jeopardizing our economy, environment, and national security. Moreover, "Foreign competition, especially in the area of technology and science, has increased substantially. As corporations struggle to find educated and skilled workers, they are looking to the shores of foreign nations more and more." Let's start with things that are in our control as educators. Let's start by making an "Extreme Makeover" in our classrooms, in our schools, in our districts. If we all play our roles and we all do "our" part, then we will have successfully transformed our learning institutions to prepare our students, for their future! Dufour, R. & Eaker, R. (1998). Professional learning communities at work. Alexandria, VA: ASCD. Muhammad, A., & Dufour, R. (2009). Transforming school culture: how to overcome staff division. Bloomington, IN: Solution Tree Press. Sheninger, E. C., & Devereaux, K. (2012). What principals need to know about teaching and learning science (2nd ed.). Bloomington, IN: Solution Tree Press. Tomlinson, C. A. (2001). How to differentiate instruction in mixed-ability classrooms. Alexandria, VA: Association for Supervision and Curriculum Development (ASCD).